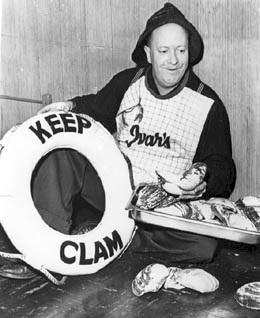 We went to Ivar's for our New Year's Eve lunch. Dan usually doesn't like for me to take photo's in Seattle (too touristy) but everything seems to change when you have Nicole and Tyler around. They make everything look BETTER. I thought this was a nice sentiment for our new year. Let's not think of it as saying Keep Clam though. Let this be the year that we Keep Calm and stop stressing out. We fancied this trip up and went to the indoor Ivar's Restaurant. We had a lovely view of the seagulls and we stayed warm. Dan's Daddy told me stories about Ivar and I think Ivar is the coolest. Dan is our very own Diver Dan. Nicole ordered the Diver Dan sandwich. Nicole is a lovely model.